We all won twice against invading pipelines this week in the Georgia legislature. A smashing 34-128 defeat of Spectra Energy’s invading Sabal “Sinkhole” Trail natural gas pipeline, by WWALS, Flint Riverkeeper, Chattahoochee Riverkeeper, Georgia Sierra Club, Georgia Water Coalition, SpectraBusters, and many others, wasn’t the only win for landowners, environmentalists, and the people in the Georgia legislature this week. Push Back the Pipeline‘s petroleum products moratorium passed the final legislative hurdle in the House and is on its way to Gov. Nathan Deal to sign. You know, if Deal had stood up for the people against Sabal Trail, too, its easements to drill under Georgia rivers including our Withlacoochee River and Okapilco Creek, would have been defeated in the State Land Commission of which he is chair before they ever got to the legislature. But we all won, and won again! Spectra, Kinder Morgan, and even ALEC lost this time. 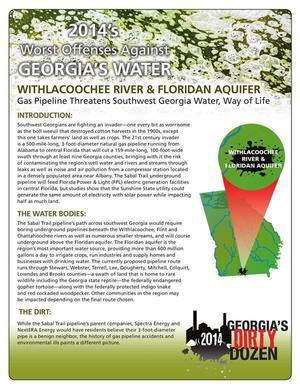 This entry was posted in ALEC, Environment, Law, Natural gas, Oil, Pipeline, Politics and tagged ALEC, Chattahoochee Riverkeeper, Don Parsons, eminent domain, Environment, Flint Riverkeeper, Georgia, Georgia Water Coalition, Kinder Morgan, KMI, LAKE, land use, Law, Lowndes Area Knowledge Exchange, Lowndes County, moratorium, natural gas, Oil, Palmetto Pipeline, pipeline, Politics, property rights, Sabal Trail Transmission, Sierra Club, Spectra Energy, SpectraBusters, Valdosta, WWALS on March 23, 2016 by John S. Quarterman. The fossil fuel opposition is the child and grandchild of Mohandas K. Gandhi and Martin Luther King Jr. With their nonviolence, truth, and action as a model, we shall overcome. This entry was posted in Climate change, CO2, Economy, Education, Environment, Georgia Power, History, Law, Natural gas, Oil, Pipeline, Solar, VSU, Water and tagged ahimsa, Bill McKibben, civil disobedience, Climate change, CO2, divestment, Economy, Education, Environment, fossil fuel, FPL, Georgia, Georgia Power, Harvard, History, Julian Bond, Keystone XL, LAKE, Law, Lowndes Area Knowledge Exchange, Lowndes County, Martin Luther King Jr., metta, Michael Brune, natural gas, nonviolence, Oil, pipeline, Sabal Trail Transmission, satyagraha, Sierra Club, Solar, Spectra Energy, Valdosta, VSU, Water on January 20, 2015 by John S. Quarterman. Here are the slides for the talk I gave at the Alabama Sierra Club Retreat 1 November 2014. This entry was posted in Economy, Environment, Pipeline, Safety, Water, WWALS and tagged Alabama, Economy, Environment, export, Georgia, LAKE, LNG, Lowndes Area Knowledge Exchange, Lowndes County, pipeline, Sabal Trail Transmission, Safety, Sierra Club, SpectraBusters, Valdosta, Water, WWALS on November 5, 2014 by John S. Quarterman. South Carolina Sierra Club Chair Susan Corbett summed up the problem with the EPA’s carbon rule: it opposes one poison while promoting others. We can make a real green clean energy policy based on conservation, efficiency, solar, and wind energy. Remember, you can still send in your own comments directly to EPA. This entry was posted in Climate change, CO2, Coal, Natural gas, Nuclear, Pipeline, Renewable Energy, Solar, Wind and tagged Climate change, CO2, Coal, FERC, Georgia, Jon Wellinghoff, LAKE, Lowndes Area Knowledge Exchange, Lowndes County, natural gas, NRC, Nuclear, pipeline, Renewable Energy, Sierra Club, Solar, South Carolina, Susan Corbett, Valdosta, Wind on July 30, 2014 by John S. Quarterman.